As my blog statement mentions……….what’s going on in the studio, or not! Well, not is it for right now. I’m anxiety ridden about needing to be in the studio but other comittments are taking me in and out of the house. That is just not conducive to working creatively when you are there. Your mind is just not there. Work at the farm is coming along, although very slowly. I’ve been over several times since returning from Italy. This last visit was to take a new bathroom vanity over. We got it put together and some of the plumbing stuff done…now to wait for a real plumber for other things that need doing. I’m really not that much of a DIY person but my husband is always determined to try to do it himself unless he just has to call a service person. My thoughts are that for things like this, it is time. Who knew there were no water cut-offs until looking………well now we know. It’s not a good thought that you might have to have water turned off all over the place just to work on a shower installation or a lavatory update. Now we have a cut off in that bathroom for the lavatory……….slow progress for sure. Sticker shock for sure as well for “you know who”. Of course, he should know I’m a bargain hunter so I’m doing the best that I can with what I’ve got. Don’t even think about me not still having painting going on in my mind..although you might wonder lately. It is there, all the beauty I soaked in while in Umbria..just waiting for the opportunity to escape into paint on canvas, or wax or collage on panel and paper. Actually, I’m pulling out work for the show at the local art musuem to see what is available and to consider picking up a few pieces if needed. The show opens mid July with area artists featured this time, which is unusual. There is a 50 year celebration going on this year for our museum…I’m in the permanent collection there so I’m honored to have been selected for one of the shows. Well……it was here, the last day to get out and bid farewell to the wonderful area around Casa Rondini. When we had our bags packed about as much as wel could and had sorted things out for our night in Rome before the flight, we set out. First we headed toward Monteleone di Orvieto and just looked around the area………then headed back to cook a little dinner and clean up. The next day we took a picture of our lovely host family, Franco, Bozena and their two daughters before driving out for the last time. 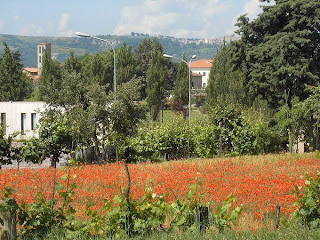 As we headed toward Fabro Scalo, we saw that the poppy field was really putting on a show for us so we had to stop to take a few pictures. I also took a picture of the sign we’d passed so many times going that way with the names of so many of the towns around there we had passed through going and coming every day. If anyone is heading to this area, you should definitely check out Casa Rondini. 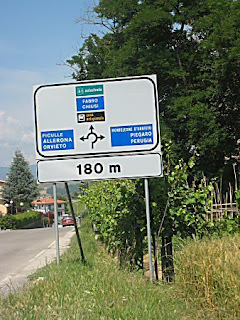 It will live up to your expectations and more as an ideal location for exploring Umbria and Tuscany. Last chance for Pizza Night at Casa Rondini. Usually pizza night on Sundays is sort of an instructional “how to make pizza”, like the pasta night. If it rains that might change since the oven is outdoors, but we will have pizza tonight…..Franco said so. (addendum: no pizza since the oven is outdoors because of rain..Stuffed Foccacia instead, with antipasti, wonderful spring peas and broadbeans from the garden, artichokes stuffed with garlic and parmesan. Ice cream and a blueberry tart for dessert. Way more food than we needed. We’re hoping our last laundry will have time to dry since it’s been rainy/cloudy for several days. If not, then pack some in plastic bags for the trip home. 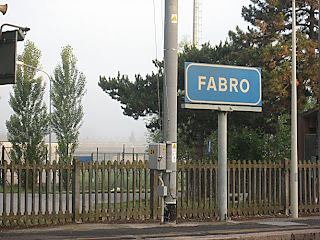 We check out of our wonderful agritourisimo Tuesday morning and make the drive back to the Rome airport and the Hilton on the grounds there. We want to get the rental car all checked in and our hotel notified about out shuttle for departure times. This has been a really marvelous trip. The time has flown by so quickly. How could it be already almost 28 days? One last little trip out this afternoon….We went to Castiligone del Lago up on Lake Trasimeno again. No bags for Pat, sorry Pat, they were closed on Sunday at the only place I found them. We had a nice lunch, looked around, headed to Citta Della Pieve again so Carolyn could pick up a last minute item. It started raining and I took a 20 minute nap in the car while she went in to shop. Boy did I need it as I was really sleepy. With that question about time passing so quickly, I’m also ready to get back in the studio. I’m thinking ahead to a big show at the local museum that will have my work featured and all that comes with slowly getting ready to move to the farm. I will be a very busy person. It has been really nice (understatement) to have no agenda for this whole trip. Every day or so we decided what we wanted to do and just went or NOT.Heaven. Umbria must be the greenest area in the world not withstanding Ireland although I’ve never been there so I wonder. 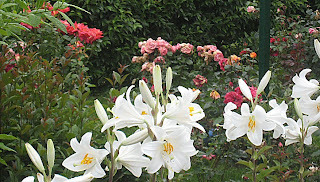 I found these pictures awaiting me as we walked to dinner………Bozena’s lilies were all in their glory. There was even a magnolia blooming today. 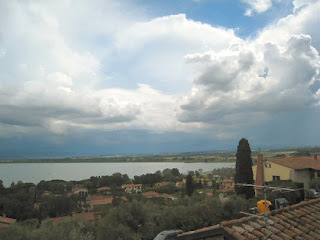 I also took some pictures of the storm rolling in as we left Castiglione del Lago. Whatever the weather, the skies here are always awesome. This day (Saturday) started with a lot of fog….I just turned over and went back to sleep. I was up early looking out due to that darn humongous crow or whatever he is pecking on the glass of the French doors in the kitchen again.He starts about 5-6 am. The only day he hasn’t wakened us this week is the day we beat him up at 4:30 am to get ready for Rome. Internet came back on so I uploaded some blog entries and downloaded to the laptop pictures from a couple of days. It looked like another good day for a pot of lentils so I did that as well. A lot of the day is spent packing bags to see what will fit, and especially what will go in checked or carry-on baggage. Hum…what to wear now for the next couple of days??? 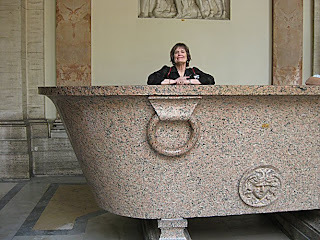 The pictures for today were really made at the Vatican Museum in Rome yesterday………….those Romans sure did love their baths. 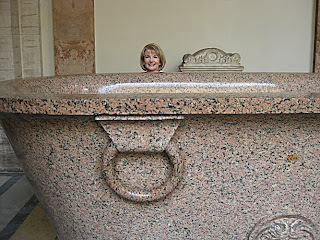 This is not the largest of the tubs they have displayed there. Looks like a big party could be held in some of these….and probably was. Whew…am I tired. I didn’t really sleep well last night knowing I had to be up at 4:30 am to get ready for a long day to Rome and back. We went on the train again and also bought a ticket on the Green Line to be able to go on and off the bus for the “sights”. We spent most of the time in the Vatican and Sistine Chapel. We had a nice lunch at a restaurant near there and had a gelato on the way to the Trevi Fountain to throw a coin in for luck and that you will for sure come back to Rome one day………..then on to the Spanish Steps. We barely made it back in time for the 5:12 pm return train trip. Tired for sure. I could see some of the other sights from the bus but we didn’t stay on it that long……also the Coliseum, etc. Maybe we’ll have time the evening before we return home to go into the city by metro …….and maybe not. We are staying at the Hilton at the airport so we can get out early for the 6:45am flight home on Wednesday. 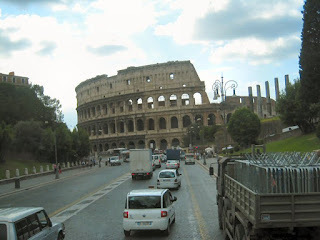 I took a couple of pictures at the signts we saw through the tour bus window……this one of the Coliseum is an example. Oh yeah…………as we got home to Fabro, there was another rainbow waiting to greet us as we drove toward the house. It wasn’t anything like the sight that greeted us on the first day we were here, but it was a good omen we think.